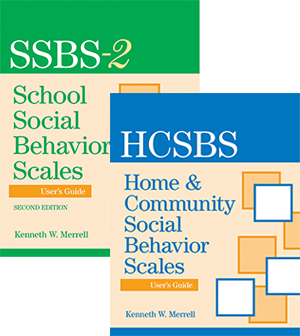 SSBS-2 and HCSBS - Brookes Publishing Co.
Two K-12 rating scales that evaluate a child’s social-emotional strengths and risk behaviors at school, at home, and in the community. Educators, parent educators, social workers, public health nurses and other person who knows the child well completes HCSBS. Catching “red flag” behaviors early is an essential part of helping children and adolescents before social-emotional difficulties become major roadblocks to success in school and in life. 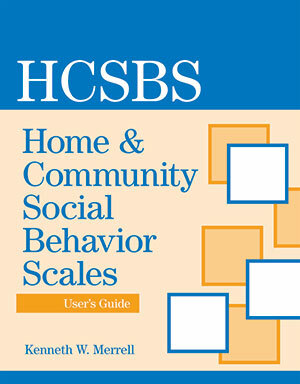 These two easy, reliable screening tools give K–12 education professionals a comprehensive look at a child’s social-emotional strengths and risk behaviors, both in school (the School Social Behavior Scales, Second Edition) and at home and in the community (the Home & Community Social Behavior Scales).